A recent sourdough crisis has prompted this latest post in what is to be a series involving ‘dough quandaries‘! I decided to build a new starter around a week ago, as the Yeasty Thing has been lying dormant in the fridge for far too long and I think it may have had its day! As described in an earlier post (linked above), the Yeasty Thing was built using Hugh Fearnley Whittingstall’s method – a straightforward flour and water concoction which is fermented, to begin with over a week, to attract and promote the growth of wild yeasties. This starter is fairly wet and, at first, I kept it bubbling away on the work surface (in a container, obviously!) feeding it a couple of times a day. But starters which contain a high proportion of liquid often rise and fall more quickly than more dense starters and the Yeasty Thing’s feeding schedule began to get out of hand – so she was banished to the fridge to slow down a bit! My latest foray into sourdough was on the instruction of Peter Reinhart in ‘Artisan Breads Every Day’. His ‘mother starter’ is built in two stages. The first of which requires building up the ferment in four ‘phases’ over 7 (or so) days. He suggests using pineapple juice in the first stage, the acidity of which discourages the growth of certain bacterias (including leuconostoc), which can overrun the yeast. Bacteria is present in all starters. It is the interaction between the yeast and bacteria cells which creates a successful culture that will raise dough. I followed Peter’s guidelines to the letter, using pineapple juice in the first stage, and my starter behaved as it should; producing all the delightful aromas he mentions all the way into the second stage, when I formed a denser, more flour-heavy ‘mother starter’. Reinhart prescribes refrigeration after the mother starter becomes active, and this is what I did. I was pleased that I potentially wouldn’t have to replenish my starter for 5 days once it was in the fridge – a boon to any busy working mum! So it was all good – my starter was safely nestled in the fridge, sedately swelling away between the milk and the orange juice. I quickly felt a sourdough loaf coming on and raided a portion of my new born starter to get baking. Reinhart’s book is sadly lacking in the sourdough loaf department – there are only a few recipes which call for a starter, so I referred back to Old Faithful, Whittingstal’s recipe for a basic sourdough loaf in ‘River Cottage: Everyday’. It calls for the starter to be fermented overnight with some flour and water, which is then mixed with more flour, water and salt to make the dough. Everything was going well, until I lifted the lid on the pre-ferment and reeled back in disgust at the sulphurous, eggy pong emanating therefrom! I hit the blogs and the Fresh Loaf came up trumps with multiple articles about sourdough smelling like rotten eggs – all describing a similar situation in which gases from the dough itself omit this unpleasant odour. Meanwhile, the starter itself still smelt perfectly normal – acidic, almost winy. Even having discovered that this was unusual, and potentially due to an overgrowth in bacteria, I went ahead and baked the dough. It resulted in a pretty good sourdough loaf with a great tangy flavour. This is the loaf that resulted from my stinky starter! My curiosity was still unsatiated and I was almost certain the eggy pong would return, should I attempt another batch of dough using the starter. So I have been searching the web ever since and have found out lots more about sourdough in the process. One interesting point to make is that in some countries, bread raised by bacteria is popular. Yeast is actually inhibited to promote the growth of natural bugs, which respire producing the gas that raises the dough (see this article about ‘Salt-rising bread‘). Maybe this is what I had produced! Sure enough, I tried another batch of dough using my new starter and, sadly, it gave off a sulphurous whiff even more pungent than the first lot. During my online research into this, I came across lots of people who swore that one Debra Wink would be able to help. I was surprised to find that the ‘solution’ she was proposing, backed by extensive research, was to replenish your stinky starter with pineapple juice! (see ‘The Pineapple Juice Solution‘) I was back where I’d started! Maybe the bacteria which developed in my dough was different to that which Debra is trying to stave off? Or maybe it is the same, but managed to take hold once I began feeding my mother starter with spring water? Who knows? Either way, something doesn’t add up! In desperation to salvage my starter, I have started feeding it again using pineapple juice rather than water. I will keep you updated on its progress over the coming weeks. I have had a jar of sourdough starter sitting on my kitchen window, unused, for about 2 months now. I opened it yesterday and there was about 1cm of vinegary water on top and no obvious mould. So I decided to try to refresh it. However, I don’t like to waste anything so I scooped half of it into a bowl (after discarding the water on top) and added a bit of water, flour, salt and yeast to create a very, very wet dough. I topped up the starter with a 1:1 mix of water and flour, after washing out the disgusting, encrusted jar. Back to the dough – after a couple of hours nothing was going on. It was getting late so I covered it up and left it overnight. When I got up this morning the dough had risen a little, really a tiny tiny amount. But the dough, when tipped onto the work surface, looked a little like I imagine ciabatta dough would look, so I chopped it into 4 ciabatta themed pieces, chucked them in the oven and voila! 4 really crunchy, slightly ciabatta-esque pieces of bread. Crunchy on the outside, rubbery with air pockets on the inside. And, so far, despite my worries given the age and neglect of the starter, I have not succumbed to food poisoning! Having never made a sourdough starter, I’ve been researching this subject myself. I can’t tell you how much I appreciate this post! I’ll be trying Nancy Silverton’s [La Brea Bakery] recipe. Hers is a 14 day starter which uses grapes. I guess I’ll know the outcome in 2 weeks! 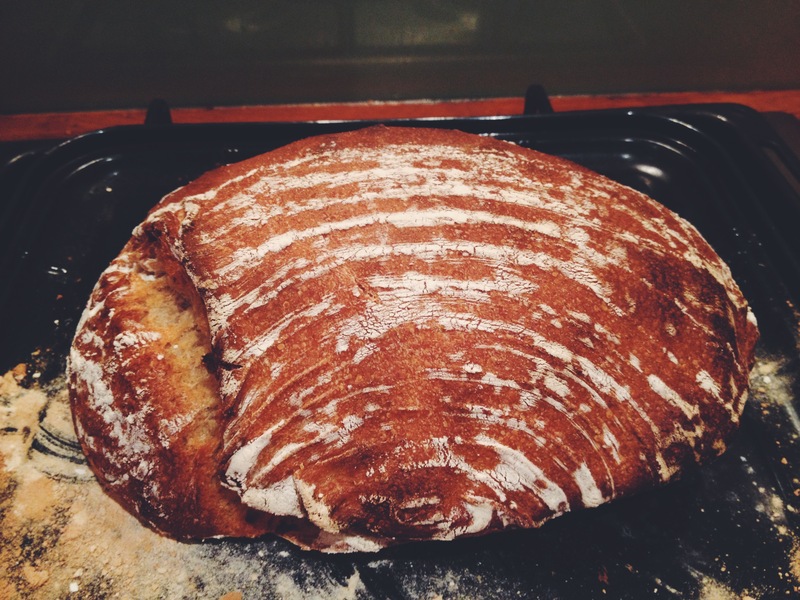 Like you I am learning about sourdough – and after 2 years, I still feel like a newbie. Like you my starter has been a considerable object of attention. Unlike you I got my starter from a baker, and have simply kept it going since then. A couple of things strike me here. One is that in your earlier post you say to use tap water. Have you tried using distilled or filtered water? A friend of mine to whom I have frequently given starter – hers ends up like yours and all we can figure out is that the tap water/RO water (which I use) is the main variable. The other thing is that I did not see how much water you use. You mention a cup of flour. A cup of water (measured exactly) yields a 166% hydration starter – as opposed to equal weights of flour and water which yields a thicker 100% hydration starter. You also noted organic flour. I think that is critical too. I use whole wheat and it works fine – though I am thinking I might start up a white flour one using some of my existing one as its base. I can also see you are not leaving stones unturned in your research. So a question in that regard: Have you investigated Northwest sourdough? http://www.northwestsourdough.com/. Its been my fount of sourdough information. Very thorough, very detailed, great interactive baker’s forum. Also have you checked out Tartine bread http://www.youtube.com/watch?v=r5kKeKSfyOE&noredirect=1 making? I found the bread section in Michael Pollan’s Cooked http://michaelpollan.com/books/cooked/ quite interesting – not in terms of the starter itself but more in terms of the politics and science of the stuff. He’s such an excellent writer. What I have found success with these days with respect to my present starter is to do the following: When I don’t ‘feel a loaf coming on’ (very nicely said) I keep it in the fridge. 2 days before baking I take it out and start to goose it up – adding that cup/cup to approximately 150ml of starter (yes – so little! ), and I pour off and do it a second time after 6 hours – (noted in my current sourdough blog http://homecookexplorer.wordpress.com/2013/08/26/my-journey-with-sourdough/).